Jeff McCall is an English singer/songwriter/producer creating a retro electronic pop sound that could have been written alongside the synthesizer bands of the 1980s. This new music has shades of more modern influences, but will still remind you of that epic period of musical creativity. He is literally a ‘one man electropop band’ writing, recording and producing all his own work. Jeff creates catchy choruses on a dance beat lifted straight from the 80s. You could say he is leading his own addictive retro synthpop revival! 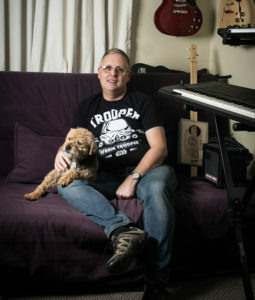 Jeff’s musical journey started as early as the 1980s. As the lead vocalist of synthpop band Malicieux Garde he began developing his songwriting and production skills. As technology advanced so did his skills and experience, and he continued creating and recording material until family life took over. After a long hiatus, the sudden desire to take some guitar lessons in 2015 rekindled the flame. Jeff started writing again in earnest and his current solo project was born. He also started singing again regularly by teaming up with a local guitarist to form a ‘covers’ duo called Shades of Grey performing at private functions and house concerts. Jeff lives in a small village by the River Gt. Ouse in the Cambridgeshire countryside with his wife Janet, and their dog Buzz. There he has a small home recording studio where all his music is made. He released his first solo EP “Perspectives” in February 2016 and his debut album “Night Life” in October 2017. Both works were released independently online through Distrokid, with CD versions available directly from his website. Whilst he has a general love of music across the board and very diverse listening tastes when it comes to writing Jeff always finds himself returning to his electronic pop music roots with the major influences coming from his musical heroes: Vince Clarke, Midge Ure and Gary Numan. Since releasing Night Life, Jeff has generated much interest in his music amongst the UK electronic music community and his music is receiving much attention. Jeff’s tracks have already been played on a number of radio stations including The Synth City show at Phoenix FM, Harbour Radio, Radio Saltire, and by none other than electronic music legend Rusty Egan on his Electronic Family Tree Radio Show. Jeff is a former Royal Navy officer who underwent aircrew training in the Fleet Air Arm. On leaving the navy Jeff’s next adventure was as a London Firefighter where he worked at many Fire Stations and management Departments all around the Capital.